« Is your Dog A Food Gulper? The kidneys remove excess water and waste from the blood. Kidney functions diminishes slowly with age. 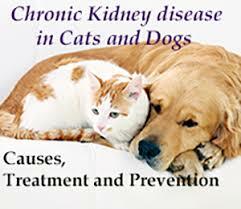 In older dogs and cats, kidney failure is a leading cause of illness. Damaged kidneys are less able to concentrate urine so the body needs more fluid. Increased thirst and urination are often the first signs of kidney disease. As the disease progresses, pets lose weight and their appetite. They play less, sleep more and may exhibit constipation and nausea. By the time most owners notice these changes, most kidney function is already lost. There is no cure for chronic kidney failure,but your veterinarian can help slow it’s progression and improve it’s quality of life. My beloved cat Molly had advanced Kidney disease and even though the disease is eventually fatal, I was able to keep Molly alive about five years with it and she had a pretty decent quality of life until the very end. This entry was posted on Wednesday, February 13th, 2019 at 10:17 am	and is filed under Pet Supplies. You can follow any responses to this entry through the RSS 2.0 feed. Both comments and pings are currently closed.